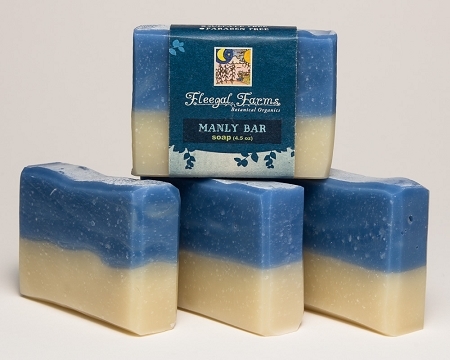 Inspired by a request from our doctor who loves our soap, but wanted to lather up in some manly suds, we created a bay based blend, and swirled in a combination of natural botanicals resulting in this bar, which has a fresh and clean scent that is sure to fill you with robust vigor. INGREDIENTS: filtered rain water, saponified oils of olive (olea europaea), coconut (cocos nucifera), and palm (elaeisguineensis), essential oils, and natural mineral pigments (ultramarine blue)essential oils, organic oats, ground cinnamon (cinammomum cassia bark), cocoa powder (theobroma cacao). I found the Manly Bar at the Texas State Fair. I consider myself somewhat of a soap-a-holic. 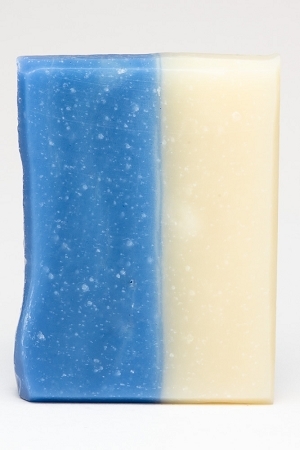 I LOVE this soap! The fragrance is amazing, not too heavy, and very refreshing. This would make a great stocking stuffer, or a really nice "just because" gift for any guy - or buy it for yourself!